The Sportsart TR63 treadmill is currently the most expensive residential treadmill from Sportsart America. And as expected, it boasts some impressive specs and features to provide excellent value for your money. If you’re looking high-end treadmills that would give you power and quality, then this is the model for you. This is the biggest and baddest Sportsart home unit in the market today. However, with a price tag of $4,500, I don’t think many can afford it. So if this machine is beyond your budget, then I suggest you to visit our best buy treadmills page and look for the unit that suits you best. 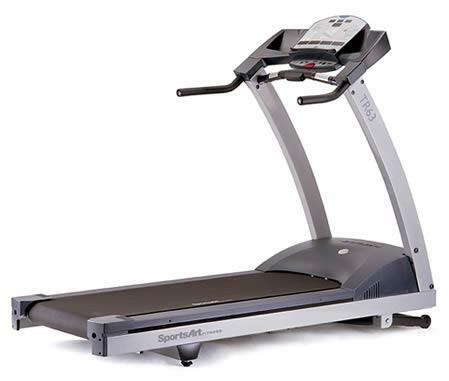 The Sportsart TR63 treadmill boasts a huge 4.0HP continuous duty motor. It has speeds of up to 12mph and inclines that reaches 15%. So it doesn’t matter whether you’re a beginner or advance runner, this motor can provide you with the intensity you need. The oversized LED's clearly show you your distance, calories, cal/HR, time, speed, incline, pace, mets, and heart rate so you’ll always know all important information regarding your progress. A new feature that can be enjoyed in the TR63 is its numerous workout programs. The Bay Run, River Run, Climber’s Trek, Manual and Quickstart programs keep your workout fresh and challenging. And with the CardioAdvisor™, an easy to use heart rate training system, you’ll get even more variety and flexibility in your exercise. Other impressive additions to this model are the 4-way reversible phenolic deck (maintenance free) and the 22 lbs., 4” sealed bearing rollers. This deck maximizes the unit’s lifespan while the bearing based rollers guide for superior belt tracking. In short, the combination of these two minimizes problems that may occur thus, increasing the life of your treadmill. And finally, this treadmill comes with longer warranties compared to cheaper Sportsart models. Its drive motor, bumper to bumper mechanical, and frames are covered for a lifetime, its electronics for 5 years, and its labor for 1 year. The biggest weakness I see in this unit is its belt size. It’s offering the same 20" x 58" running surface that can also be found on their cheaper Sportsarts. And in this price range where most treadmills boast oversized tread belts, this is a little disappointing. I would recommend the Sportsart TR63 treadmill for the incredible value you’ll get from buying it. However, in this price range, you’re only around a thousand dollars away from owning a decent commercial treadmill. And commercial models are definitely better than this one. If you plan on buying a Sportsart TR63 Treadmill, I suggest you buy directly from Amazon for $4,499.